The Burrard Street YMCA looks as good today as it did when it was built in 1940. That’s because it’s a restored façade with a new structure behind it, and a child care on the top. We saw a glimpse of the building in an earlier post. Fortunately, when it came to redeveloping the building a few years ago there was a natural break in the Barclay Street frontage that allowed the residential tower and new gym and swimming pool to fit in behind without overwhelming the retained brick building. Our ‘before’ image is from 1981, and the building was already starting to show its age. By the early 2000s there was a definite need to renew, and ideally replace the building’s facilities. The 1940 building was at least the third YMCA in the city and was designed by McCarter & Nairne, ten years after their Marine Building. The ‘Y’ was a much more modest building, but one that still had some robust moderne modeling within the limited budget. In 2003 Stantec Architects (and subsequently Endall Elliot) designed the replacement which had slightly less space for the YMCA than the original, but includes a pool, gymnasium, racquet courts, health studios, support facilities, and also a licensed Child Day Care Facility, including a family and child development centre, on the fifth and sixth floors. Concert Properties built the 42 floor project and sold the residential tower above, named ‘Patina’. We’ve seen one building on this end of the west side of the 900 block of Granville Street in an earlier post – the Vermilyea Block (painted cream these days) – the fourth building along. Beyond it is a pair of warehouse-like buildings that today are Tom Lee Music. They’re a Dalton and Eveleigh design for C H Wilson, and so were once known as the Wilson Block. On the corner (and just showing on the right of the picture) is an early rooming house. We’re reasonably certain this is another Parr and Fee building. A Granville and Smithe corner site was granted a building permit in 1906 for McCaulay & Nicolls, and those were still the owners of this building in 1915 and 1916 when two sets of repairs were carried out. Today they’re known as the Gresham Hotel, and they are non-market housing, converted from Single Occupancy Rooms in 1993. When it was first built they were called the Gresham Apartments, and they don’t seem to have been occupied until 1909. The 1912 insurance map for some reason mislabeled the building as the Gresman Apartments. The City Drug Store were the first tenants in the corner retail unit – in 1967 it was Electronic World, selling TVs and tape Recorders. The developers, Macaulay & Nicolls, were insurance and real estate agents. We looked at John P. Nicoll’s history when we featured his house on Seaton Street. Charles H Macaulay was from Nova Scotia, born into a family that left Scotland in the late 1700s. He was part of the Canadian Pacific development team, working for the railway from 1887. In the same year he partnered with John Nicoll, 1898, he married his wife Ethel, and they had four children, Donald, Douglas, Margaret and John. As well as being a member of the Board of Trade and a Freemason, Charles was a member of the Terminal City, Shaughnessy Heights Golf Club, Jericho Country Club and the Canadian Club. Next door was once another rooming house, the Henley Rooms, built for Mr Musgrove in 1910, and also designed by Parr and Fee (although with a traditional sash arrangement in bay windows, rather than the centre-hung design they often favoured). Baynes and Horie built the $18,000 property. We don’t know who Mr Musgrove was – there were only two people in the city with that name at the time, and neither seem a likely candidate for an $18,000 investment. The rooms went through a lot of changing management – in 1911 they were run by Mrs. Maud Sherman, an American who had arrived the year before the 1911 Census and who only one lodger that year, Edith Cochran who had also arrived from the USA in 1910 and was listed as having no occupation. In 1912 the rooms were run by Mrs. Maud Ogle, in 1913 John Pausche took over, replaced by Norman Andison in 1915, Paul Parent in 1916 and Thomas Dyde in 1918, who finally provided stable management through the early 1920s. The building was demolished to be replaced in 1993 with the smaller building there today designed by Gower, Yeung & Associates. In 1967 it featured Mr. Mike’s $1.49 char broiled steaks. Next door was the Studio Theatre, designed by H H Simmonds in 1948. It was one of his last designs, and he had been the architect for a series of theatres (really cinemas) from the early 1920s. It was still the Studio when this 1967 image was shot, (showing The Graduate), but not too long after it became the Eve, then the Lyric, and after that the Towne Cinema (with a protest outside the showing of Bob Guccione’s Caligula) and finally the Paradise Cinema, before it closed and fell into disrepair. Buying a liquor licence that once belonged to the infamous Pony’s Cabaret in the Downtown Eastside, David Kershaw and his partners transferred it to Granville and then began renovating the building as the Tonic Nightclub. More recently it became the oddly named Joe’s Apartment (which was still a nightclub, despite the name). Earlier this year the establishment once again reverted to the Studio name, with a record store and live music venue combined, and a fabulously faithful replica of the original 1940s sign. These single storey stores on the corner of Granville and Nelson were built in 1919, and photographed within a couple of years of construction. These seem to be the first substantial buildings here; there was a Paints & Wallpaper’ building with frame construction that occupied a 25′ lot just north of the corner with Davie in the early 1900s. The architect of the 1919 stores was listed as H R Burns – if it’s accurate he was an obscure designer whose only known work in the city is this building (and there’s nobody in Vancouver or Victoria with the name Burns and those initials who was an architect, either). The builders of the $17,400 investment were Turnbull & Curr, and the owner was Dr O C Gilbert and Associates. Dr. Gilbert was a dentist. He also practiced in Victoria, and the first time he appears in the city was in 1913. In 1919 he was shown living on Vernon Drive, with a practice on West Hastings. In 1920 he was in practice as Gilbert & Anderson, and he had an apartment on Jervis. We’re not sure if it’s entirely a coincidence, but there’s also a Dr Orlando Gilbert who practiced dentistry in Washington state, having developed a property in Bellingham in 1906. He was born in Indiana, and was shown living in San Francisco in 1900 and Bellingham in 1910 and 1920. 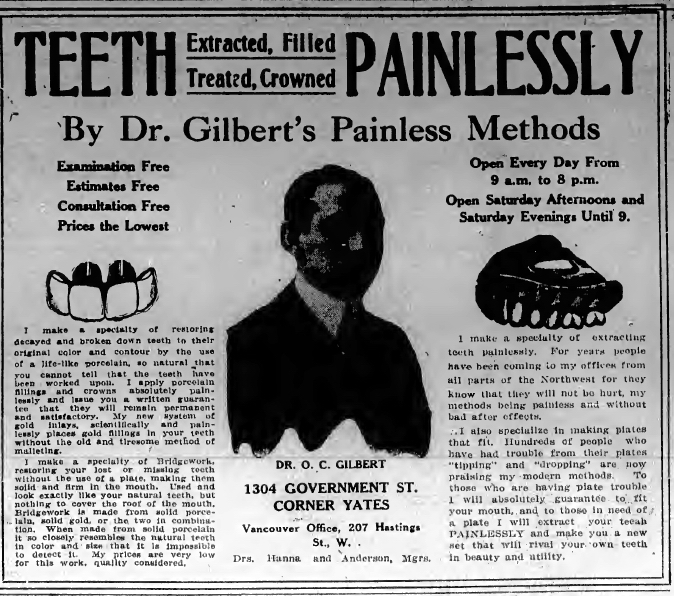 It’s possible Dr Gilbert ran a practice across the border, (and there’s nobody in either the 1901 or 1911 census records in Vancouver with his name) or less likely, that there were two dentists at the same time with the same surname and initials. He died in Los Angeles in 1946. We’ve been entirely unable to identify the architect or builder of the small 2-storey building next door. R E Gosse & Sons, plumbers, were the first company at this location in 1906, and they obtained the building permit for the $3,500 building that year. In 1908 it became the Royal Restaurant, we think Lucy Olmstead’s rooming house was upstairs. Next door, disappearing off the edge of the picture, was the Dominion Theatre, built in 1911 by the Dominion Theatre Co (run by J R Muir) with a design claimed by E J Ryan in the building permit, costing $50,000. Mr Ryan wasn’t an architect – he was a builder, and this was one of two examples where we find him taking credit for the design of a substantial project. Thanks to Patrick Gunn’s digging in a May 1911 Vancouver Daily World we know that Mr Ryan was overlooking the architectural efforts of the most prolific architects in the city at the time, Parr and Fee. It became the Downtown Theatre in 1967, then the Caprice Showcase Theatre, closing as a cinema in 1988 but retaining the name in its new incarnation as the Caprice Nightclub. Inside is also the L.E.D. Bar, a mini-club that claims to cater to Vancouver’s elite. It’s not entirely original – apparently the original cinema auditorium had a ceiling that consisted of glass with backlit lighting above. While the Caprice lives on inside the Dominion’s frame, the other buildings were replaced in 1973 with a two-storey concrete structure. The context for the building has changed considerably with the development of 980 Howe, Manulife’s new office block. Image source: City of Vancouver Archives CVA 1376-279. This early commercial block has seen better days. The detail of the cornice has gone; half the glazing has been covered up and the entire front has been covered in pebble-coated stucco. In 1949 it was effectively rebuilt, and most of the detail of the Parr and Fee design from 1898 was lost. Our ‘before’ image comes from a 1900 publication, ‘Vancouver of Today Architecturally’, a promotional brochure put together by some of the city’s architects of the day, including Parr and Fee (who had so much work at the time that it’s surprising they felt the need to advertise for more). 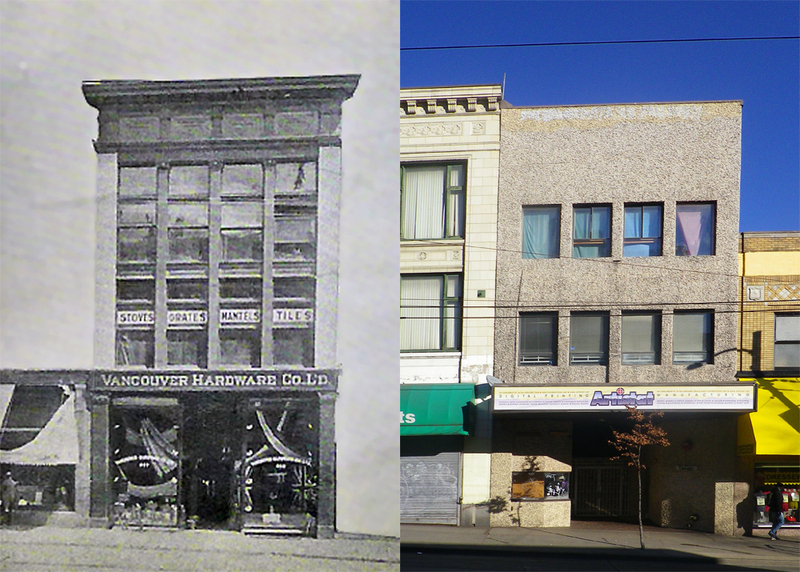 This was featured as the Vancouver Hardware Co, and they were shown as being based at 395 W Hastings in 1898 – which could have been this location before the street was re-numbered. Under A O Campell’s management, they had moved from Cordova where they were located in 1897. In 1898 Thomson Stationery were next door at 393, having moved from Cordova in 1897 as well. In 1899 both Thomson Stationery and Vancouver Hardware were listed at 325 West Hastings – but we think the directory just missed the street number for this address and there were two different buildings – both designed by Parr and Fee in 1898. That certainly seems to be the case in subsequent directories, and the 1901 insurance map, which listed this as 339 West Hastings. 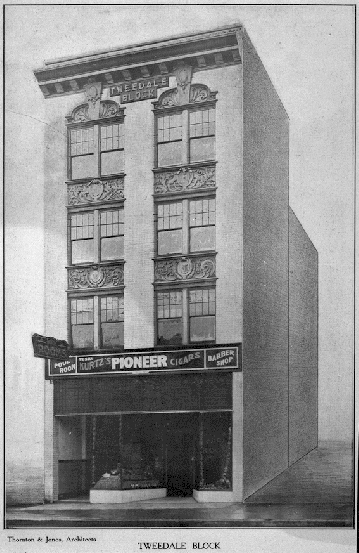 The very first building that has been identified being designed by Parr and Fee in the city was in 1898, on West Hastings Street for the New England Furniture Co. That company appears to never have taken up residence in the city, so it’s quite possible that this was the building they commissioned. (There’s no record specifically identifying Vancouver Hardware commissioning the architects – we only have the attribution because of the brochure image). We know which tradesmen contributed to the building – the Vancouver Cornice and Roofing Company on Seymour Street, W N O’Neil supplied the plate glass and steel beams, Barr and Anderson carried out the plumbing, George Hinton the electrical wiring and fittings and Vancouver Electrical Works the electrical work. W J Beam supplied the sashes (not the centre-hung widows found on many Parr and Fee buildings) and E Cook was the building contractor. A O Campbell, the manager of Vancouver Hardware, was a pioneer, having been in the city when it was created. He was clerk at the Hastings Mill store in 1880, a partner with E W Ogle in a dry goods, clothing and gents furnishings store in New Westminster in 1889, and as a hardware merchant as Campbell & Andersin in New Westminster in 1893. By the late 1890s he was managing Vancouver Hardware, and the 1901 street directory has him living at 325 Princess Street (E Pender Street today). The census says he was aged 38, living with his 27 year old wife Violet and their daughter Dorothy in her parent’s house. John and Mary Bannerman owned the home, and their younger son, also called John lived with them, as well as Kamie Yasuka, their Japanese domestic. Mr Bannerman was Scottish, his wife Margaret was born in Ontario, and Mr. Campbell was born in Quebec. The 1901 census says he was Alfred O Campbell; the 1911 census (which was so often wrong) says he was Oliver A. and aged 40. Another daughter, with a name something like Alieca had been born in 1903 (the clerk’s handwriting is poor – and he was running out of ink! ), and the Bannerman family were still in the same house. The domestic was now just called Lee, and the family had moved to Point Grey Road. In 1938 Mr. Campbell had retired and was living in a senior’s home. This modest commercial building is still standing over 100 years after it was built. We think it was in part designed by the prolific Parr and Fee partnership – that’s their trademark centre-hung windows in the 1940 Vancouver Public Library image. The tax record says the building dates from 1910, but we suspect the bones are older than that. In 1909 Parr and Fee were hired to alter the building at a cost of $7,000 – suggesting a very substantial change. Their client was listed as H Abbott. We assume this has to be the former superintendent of the Canadian Pacific Railway. Although there were other people called Abbott in the city (all called Harry) no others were likely to own a Granville Street property. 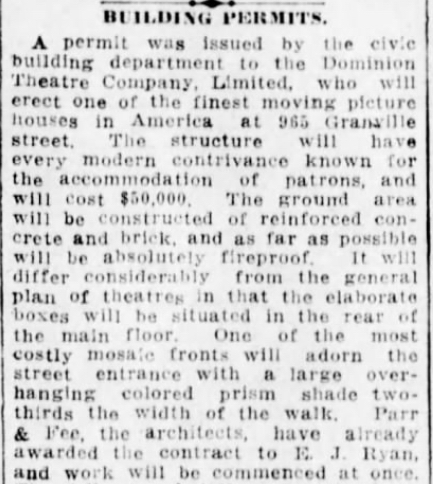 There were a series of buildings that were early investments funded by CP Directors along Granville Street. Checking the 1903 insurance map confirms this was indeed the Abbott Block. 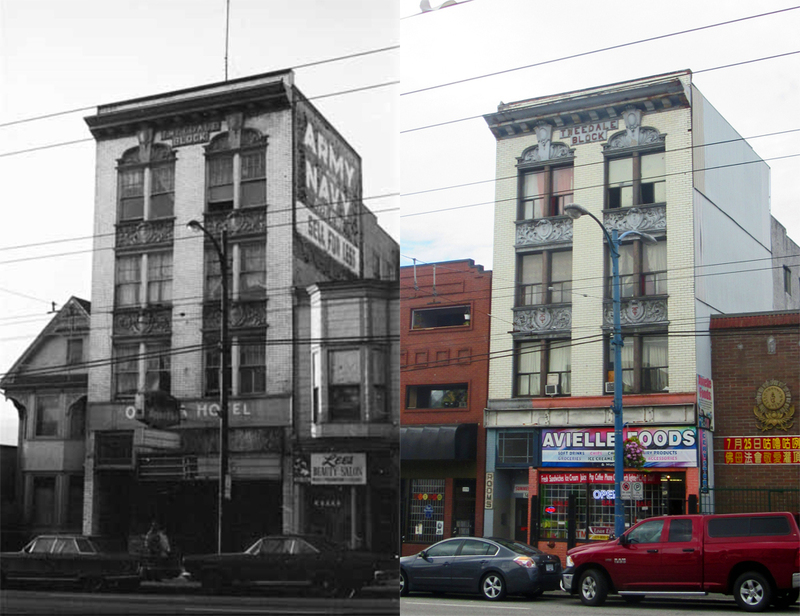 (There was also an earlier building with the same name on West Hastings Street that dates back to the 1890s). It was originally commissioned to be designed by the Fripp Brothers in 1889, the same year that a Hastings building was also built to their designs. A year earlier another Abbott Block had been built on Hastings, designed by N S Hoffar. We saw this Granville building in context in an earlier post, but by 1940 the store fronts had been altered quite a bit. To the north at 548 the Polar Fur company had their store, and to the south in 552 were Betty’s Hat & Gown Shoppe. Maison Henri had the biggest sign, and occupied the centre unit for their beauty salon. Polar Furs were run by Conrad Matoff, while Betty’s was owned by Mrs B B Crawford. Maison Henri had been in business a long time – as early as 1910 the West Hastings store announced “TO THE LADIES OF VANCOUVER: We wish to announce to our numerous clientele the return of Mr. Henri from Europe, where he has been taking up the NESTLE PERMANENT HAIR WAVING with the inventors, C. Nestle & Co. direct. This is the new complete wave, and entirely eliminates the old home treatment of heating by hand. You should come in after the return of Mr. Henri on Thursday to see the beautifying effects. Appointments may be booked from Thursday. The beautiful wave effect will absolutely not wash out. In fact noisture only accentuates the wave. To see is to believe. Let us demonstrate. MAISON HENRI, The Premier Hair – Dressing House of Vancouver”. 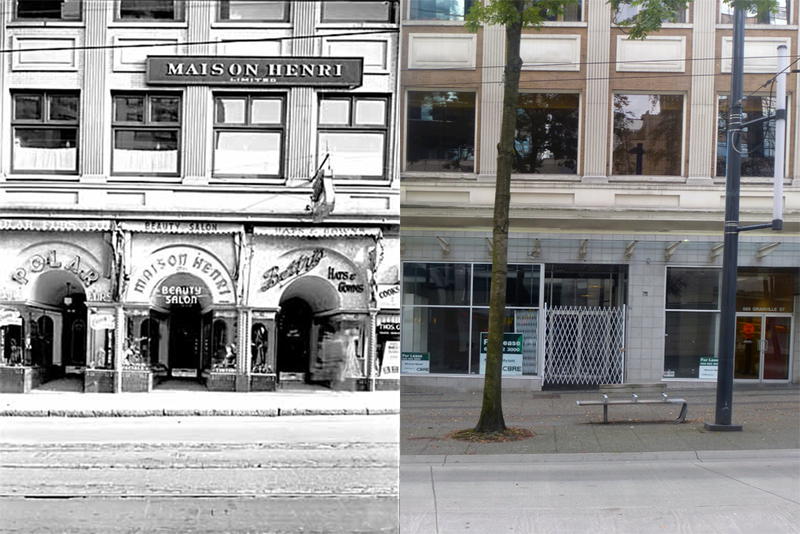 By 1940 Maison Henri described themselves as Vancouver’s Oldest, Largest and Most Exclusive Beauty Salon. If exclusive implies a bit too expensive, Maison Henri could help with that; next door at 556 Granville was the “Maison Henri Ltd Annex – First Class Beauty Work at Lower Prices”. Henri Gautschi was Swiss according to the 1935 record when he became Canadian, although his 1911 Census record and his death registration said he was French. He arrived in Canada in 1905, and his wife May a year later. She was born in London, England, and was seven years younger than her husband. By 1911 they had a daughter, Nancy. May died in 1931, the year that Nancy emigrated to Honolulu, Hawaii (although we think she returned and married in Vancouver later). Henri died in Vancouver in 1951, having retired not long after this picture was taken; his business was contined until after the war, run by Miss A D Sutherland. The Tweedale Block is one of a number of surviving four-storey buildings on East Hastings that look quite similar top each other. That’s because the architects, Thornton and Jones, were responsible for several buildings here. This one was built in 1910 (and not 1915 as the Heritage Statement says) at a cost of $26,000 by Baynes & Horie for Cyril Tweedale, who had his name placed just below the cornice line. His initials are also set in a cartouche among vegetative decoration on the spandrels. The building was built as a rooming house, and operated under the name of the Olympia Rooms (later the Olympia Hotel) until 1987, when the name changed to the Sunlight Hotel. It continues to be used for residential accommodation. It has changed very little in the 100 or so years it’s been standing, and so relatively little since this 1972 Curt Lang image in the Vancouver Public Library. Two years after this building was built he had another $33,000 apartment building constructed on Pendrell Street, designed by Sharp & Thompson. That’s also still standing today, although significantly altered in appearance. Cyril was an investment broker and realtor. He was born at Bacup, Lancashire, in 1881, and was christened Cyril Aitken Tweedale, the middle name coming from his mother, Fanny. The family may have moved south as Cyril attended Portsmouth Grammar School and King’s College University in London. He started in banking, but in 1903 he moved to Canada as a member of the “Barr Colony.” The Reverend Isaac M. Barr had set up a plan to establish a community of British settlers, who would take up farming in Saskatchewan. Cyril joined a group of about 2,000 proposed settlers, most of whom had almost no experience in farming. He travelled with one group of the colonists on the S.S. Lake Manitoba, which sailed from Liverpool in March 1903. Much more fascinating detail is available on the westendervancouver blog. He initially worked for Richards & Akroyd, insurance, financial and real-estate agents, “one of the oldest and most prominent firms in that line of work in Vancouver”. Mr. Tweedale rose through the various departments of the business, and was made manager of the real estate department, acting in that capacity until 1910. He started working for himself, and set up his own finance business called London and Western Canada Investment Company, which he operated until the late 1920s, when he joined the Royal Trust Company. The Investment Company were involved in both finance and insurance, specializing in handling transactions for English investors. Cyril married Clara Wood, from Montreal, in 1906, and they had three children; Phyllis, Cyril Dudley and Esme Josephine. His list of interests was broad; he was a military man, in both the infantry and cavalry. He was a member of the Automobile Club, the Canadian Highway Association, the Vancouver Horse Show Association, the Canadian Club, the Royal Yacht Club, the Vancouver Hunt Club and the Brockton Point Athletic Club. In 1916 the family moved to Victoria, and in 1918 he joined a tank corps, fighting in France. He moved back to Vancouver after the war, starting up his real estate business, and in 1922 he built a house on Angus Drive. He continued working through to the 1930s, and died in 1938. His wife, Clara, died in 1954. This (very) low rise building sat mid-block on Haro Street just off Burrard. The building permits suggest that Robert F Tegen was the architect of the Parish Hall and School for the Roman Catholic Church built on this site in 1913 at a cost of $100,000. Tegen was a German born architect who didn’t really practice in Vancouver; he was based in Portland, and the developer was listed as the Church of the Holy Rosary. His only other Vancouver work also had a Catholic client – St Paul’s Hospital, and his contribution to that facility (the centre block) was also built in 1913. His specialty was hospital design (at least one Oregon hospital design suggests he liked to recycle successful design elements), but he also designed the Crystal Ballroom in Portland in 1914 (as the Cotillion Hall). The problem for us is that Tegen’s building was never built – presumably the Catholic’s plans changed, or finances weren’t forthcoming during the recession that hit the city around 1912. Four apartments were on this site until the mid 1920s, when this 24-unit apartment building was constructed. Frederick William Franklin Cross drew up the designs in 1926, and this picture dating from 1927 presumably shows the newly completed building. Cross was an English-born architect who practiced in Vancouver for over 15 years, mostly designing houses, but with a few more significant projects like this, none of which appear to survive today. He was already 70 years old when he designed this building, and had been in Canada from at least 1912 (when he initially worked for Parr, Mackenzie and Day). In Vancouver he preferred to be known as Franklin Cross – before that in England he was sometimes listed as F W Franklin Cross. The first year it was operating, the St George Apartments were being run by George Roadnight – we don’t know for certain if he developed it, or just ran the building, but we suspect it was his investment (and the name of the building a pun based on his name). George was originally from Denham in England, was president of the Elks in BC in 1930, and before this building he managed a larger building, the Angelus Hotel on Dunsmuir Street (designed by Parr Mackenzie and Day in 1912 – so possibly by Franklin Cross). In 1911 George had just arrived in Vancouver in the same year, was aged 25 and was working as a night clerk in a hotel, lodging with the Howard family at 969 Main Street. A year later he was working at the Alexandra Hotel, and living on Prior Street. In 1913 he owned a house on E 30th Avenue that he altered by adding an additional room. George was still running the apartments in 1940, although he retired soon after. He died in Vancouver in 1973, having never married. The St George Apartments were still standing in 1974, as this picture shows. In 1980 City View was developed here by Qualico Developments, with 160 apartments over 7 floors.